Illinois Dermatology Institute (Chicago) - Book Appointment Online! **Please arrive 10-15 minutes early for your appointment to complete intake forms, bring a photo ID and your current insurance card to your appointment, and provide 24-hour notice if you need to cancel your appointment otherwise there will be a $50 cancellation fee. ** Please keep in mind when scheduling your appointment that Full Body Skin Exams, Acne and Psoriasis will be their own visits and no other skin conditions will be addressed as these visits will take the entire appointment time. It is to the doctors desecration whether or not multiple skin issues will be addressed. If scheduling for Cosmetics or Hair Loss, please contact our office for appropriate scheduling. 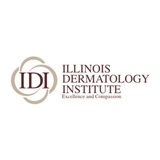 The Illinois Dermatology Institute is a collection of forward-thinking and patient-care driven dermatologists, and Dr. Lewitt is proud to be part of this high-quality group. Very knowledgeable and very professional. One of the better doctors I see.